"So many men before thy Altars kneel Unthinkingly, to promise brotherhood; So few remain, humbly to kiss thy rood With ears undeafened to thy mute appeal; So many find thy symbols less than real, Thy teachings mystic, hard to understand; So few there are, in all thy far flung band To hold thy banner high and draw thy steel And yet . . . immortal and most mighty, thou! What hath thy lore of life to let it live? What is the vital spark, hid in thy vow? Thy millions learned as thy dear paths they trod, The secret of the strength thou hast to give: "I am a way of common men to God." Similarities exist in all the degrees of Ancient Craft Masonry. Each has an entry, a reception, a circumambulation, an obligation, a bringing to light. Each discovers certain symbols to the initiate and, in demonstration and in lecture, gives him the key by which he may unlock the door behind which he will find their meaning. In its Second Section the Sublime Degree departs from the familiar. Instead of being concerned with moral principles and exhortations, as is the first degree, or with architecture and learning, as is the second, it answers the cry of Job, "If a man die, shall he live again?" The degree delves into the deepest recesses of a man's nature. While it leads the initiate into the Sanctum Sanctorum of the Temple, it probes the Holy of Holies of his heart. As a whole the degree is symbolical of that old age by the wisdom of which "we may enjoy the happy reflections consequent on a well-spent life, and die in the hope of a glorious immortality." But it is much more than that. It is at once the universal and yearning question of man throughout all ages and its answer. To teaches no creed, no dogma, no religion; only that there is a hope of Immortality; there is a Great Architect by whose mercy we may live again, leaving to each brother his choice of interpretations by which he may read the Great Beyond. It teaches of the power - and the powerlessness - of evil. For those who are happy in a belief in the resurrection of the physical body, the Sublime Degree has comfort. For those whose hope is in the raising only of that spiritual body of which Paul taught, the degree assures of all the longing heart can wish. When the lesson of the greatest hope and the dearest wish of all mankind is made manifest, the Sublime Degree turns to this life and this brotherhood, and in the symbolism of the Lion, the exposition of the Five Points of Fellowship, the means by which a Mason may claim all that a man may from his brother, and the Word, ties together the Hiramic Legend and daily living in a manner which no thoughtful man may see and hear without a thrill, a way at once awe-inspiring and heartening, terrible but beautiful, sternly uncompromising yet strangely comforting. It is because the degree is all this - and more, much more, which cannot be put into words - that it means so much to those of whom it becomes a part. The ceremony is not of the earth, earthy, but of that land of the inner life, that home of the spirit where each man thinks the secret thoughts he tells never - never. Pull the flower to pieces; remain the petals, a perfume, but no rose. Play the symphony, isolated note by note; sound is heard, but no music. Every word Milton wrote is in the dictionary but great poems may not there be found. So of any written account of this degree; we may write of its symbols, analyze its legend, tell of its meaning, but we pronounce but words without a rhyme, make a flower of wax, a song muted. The best we may do is to point out a path up the high mountain of spiritual experience which is the Sublime Degree, that he who climbs may see it with a new view - and clearer eyes. "REMEMBER NOW THY CREATOR . . ."
Remember now thy Creator in the days of thy Youth, while the evil days come not, nor the years draw nigh, when thou shalt say, I have no pleasure in them. While the sun, or the light, or the moon, or the stars, be not darkened, nor the clouds return after the rain: In the day when the keepers of the house shall tremble, and the strong men shall bow themselves, and the grinders cease because they are few, and those that look out of the windows be darkened, and the doors shall be shut in the streets, when the sound of the grinding is low, and he shall rise up at the voice of the bird, and all the daughters of musick shall be brought low: Also when they shall be afraid of that which is high, and fears shall be in the way, when the almond tree shall flourish, and the grasshopper shall be a burden, and desire shall fail: because man goeth to his long home, and the mourners go about the streets: Or ever the silver cord be loosed, or the golden bowl be broken, or the pitcher be broken at the fountain, or the wheel broken at the cistern. Then shall the dust return to the earth as it was: and the spirit shall return unto God who gave it. Of the two favourite interpretations of Biblical commentators one makes this dramatic passage a description of old age and senile decay; the other, a reference to the seldom experienced and much feared thunderstorm in Palestine. The first gives advice to remember the Creator before the eyes begin to go blind, the hands begin to tremble, the legs to weaken, the teeth to drop out; before the old man is frightened at every little sound, even the voice of a bird, before his voice ceases to be musical; before "the almond tree shall flourish" - that is, the hair whiten like the almond tree in bloom - and so tiny a weight as that of a grasshopper be burdensome; before the silver cord (spinal marrow) be loosed or the golden bowl (heart) be broken and so on. Whether or not the writer of this passage possessed a sufficient knowledge of anatomy to refer to the spinal cord, heart, internal organs, and brain as the "silver cord," the "golden bowl," the "pitcher," and the "wheel," is problematical. The storm interpretation is not open to such an objection; the little mills with which women ground corn would soon cease in the face of the feared thunder; the women in the houses would draw away from the windows and shut them and also the doors, but there is some difficulty in fitting the grasshopper and the almond tree into this analogy. Read it how you will, the majestic and awe-inspiring poetry rings here the solemn warning with a shake of the heart and a shiver up the back.... Remember now thy Creator . . . now, before the fearsome storms of life, or the decay of old age is upon you; wait not until "fears are in the way" to cry for help to the Almighty. Delay not until toothless, sightless, white-haired age asks for help from on high because there is no help left on earth! Remember now thy Creator, while limbs are strong and desire ardent, while life pulses redly and the world is all before . . .
No man thinks of his Master Mason's degree but hears again in his heart at least the beginning and ending of this sermon in poetry: "Remember now thy Creator, in the days of thy youth; . . . then shall the dust return to the earth as it was and the spirit shall return unto God who gave it " The solemn strokes on the bell which is Ecclesiastes and the heart-gripping drama of the Legend of Hiram Abif are never to be known apart by him who has met them together. Learned students have attempted to fix the date - as if dates mattered! - when the Hiramic Legend first made its appearance in Freemasonry. Their conclusions are more negative than positive, and none has gone behind the fact that in one form or another the Hiramic Legend is among the oldest as it is among the dearest myths of the human race. One may agree that documentary evidence does not put the legend of the martyred master workman into the third degree prior to 1725 and still see in it a recasting of the race-old drama of man's hope for immortality. A dozen or more suggestions have been made by Masonic students as to what the legend means. Some take it literally even though the Old Testament says nothing of the death of that Hiram which Solomon fetched out of Tyre who "wrought all his work." Others believe it is another way of telling the story of Isis and Osiris - itself a legend which could hardly have been foisted on the people full born from the brain of some clever priest but must have been an heritage from the Hyksos, or even earlier inhabitants of Egypt. Fancifully, some see in it a modern version of the death of Abel at the hands of Cain, and of course thousands visualize it as the death and resurrection of the Man of Galilee. Search the Great Light; you will find no account of the tragedy of Hiram Abif. You will learn of Hiram, or Huram. If you delve deeply enough in Hebrew you will learn that "Abif" means "his father" which may indicate another Hiram, a son. Modern scholarship translates Hiram Abif as "Hiram, my father" meaning a Hiram looked up to, venerated, given a title of honour, as the father of a tribe, the father of an art, the father of the sacred vessels of the Temple. But of the Three, the tragedy, and the Lost Word, the Old Testament is silent. Nor will you find in secular history any account of the drama of Hiram. For its truth you must delve into the myths and legends and fairy stories in which the race has half concealed, half revealed, those truths which do not bear telling in plain words. Is there a Santa Claus? For six years old there is. For his elders Santa Claus is a means of telling a beautiful truth in terms which six years old can understand. Is the legend "true"? What is meant by "true" ? If the translation of "true" is "historically accurate," obviously neither Santa Claus nor Hiram Abif is "true." But if "true" means "containing a great truth," then both the myth of the Yuletide Saint and the Legend of the Master Builder are true in the most real sense. Raised to the Sublime Degree, many men see in the living, the dying and the raising of the Master only a literal drama, designed to teach the virtues of fortitude and inflexible fidelity. For those whose ears hear only the melody and are deaf to harmonies, for those whose eyes are so blinded by the sunset as not to see the colors, this is good enough. Yet any literal interpretation of the legend and our ceremony which exemplifies it misses its heart. The Legend of Hiram Abif is at once the tragedy and the hope of man; it is virtue struck down by error, evil, and sin, and raised again by truth, goodness, and mercy. It is the story of the resurrection of that "which bears the nearest affinity to that supreme intelligence which pervades all nature." It is the answer to Job. It is at once the beginning of the even more sacred legend - of that which was lost - and the assurance that at long last he who seeks shall find. How long is a rope? A silly question! It can be answered, presumably, if one can find one end and measure it to the other. Suppose the rope has only one end? Sillier and sillier! But if two ends are true of a rope, are they true of space and time and eternity? If time has a beginning, it has an ending. If space commences somewhere, there also will be its end to be found. If eternity has a beginning, it is not eternal! Here is the shock, the surprise, and the glory of the third degree. It presents us with eternity in the midst of life. It pushes back the confines of our little dimensions, our tiny measurements of time, our small comprehension of space and shows us that we enter eternity at neither birth nor death. We have always been in eternity if we are in it at all. Hiram Abif was gathered to his fathers when the selfishness and sin of misguided men struck him down. But they were powerless against the Paw of the Lion and the might of Freemasonry. Each of us is born, lives his short life and, wearing his little white apron, is laid where our forefathers have gone before us. The drama of the third degree assures us that the life from birth to death and including both is but an episode, a single note in the great symphony. The Hiramic Legend is the glory of Freemasonry; the search for that which was lost is the glory of life. Never may we find it here. You shall gaze through microscope and telescope and catch no sight of its shadow. You shall travel in many lands and far and see it not. You shall listen to all the words of all the tongues which all men have ever spoken and will speak - the Lost Word is not heard. Were it but a word, how easy to invent another! But it is not a word, but The Word, the great secret, the unknowableness which the Great Architect sets before his children, a will o' the wisp to follow, a pot of gold at the end of the rainbow. Never here is it to be found, but the search for it is the reason for life. The Sublime Degree teaches that in another life it may be found. That is why it is the Sublime Degree. In the Entered Apprentice's and Fellowcraft's degrees the altar is the place of obligation. Here in due form the initiate takes upon himself those duties and offers those promises which make of the candidate an Entered Apprentice, which pass the Entered Apprentice to the degree of Fellowcraft. In the Master Mason's degree the altar is more - much more. It now becomes the Masonic Holy of Holies, which the Great Light teaches us was the center and heart of both the Tabernacle in the Wilderness and the Temple of Solomon. In the Holy of Holies was the Ark of the Covenant, over which the Shekinah, the very spirit of God Himself, glowed in a radiance too bright for mortal eyes. ... God called unto him out of the midst of the bush and said, Moses, Moses. And he said, Here am I. And he said, Draw not nigh hither; put off thy shoes from off thy feet, for the place whereon thou standest is holy ground. In the East the worshipper removes his shoes that the Temple be not defiled. The Rite of Discalceation does not proclaim that the Masonic initiate will defile the Temple of Freemasonry, but that he is thus made to recognize that "the place whereon thou standest is holy ground" - a place not to be approached as are other places, but one into which one walks as set forth in the prayer book, "reverently, discreetly advisedly, soberly, and in the fear of God." Some things may not be written; not so much that it is forbidden as that they are not to be expressed in words. Kneeling before the altar of the Great Architect of the Universe to offer petition for himself, alone with his Maker, the Freemason is himself a symbol of that strange relationship which all feel and none may speak; that oneness with infinity by which he whose heart is quickened may understand - as much as it may be understood - the Fatherhood of God and the brotherhood of man. The lion is one of Freemasonry's most powerful and potent symbols both in the Lion of the Tribe of Judah and the paw of the lion. Judah was symbolized as a lion in his father's deathbed blessing. The lion was upon the standard of the large and powerful tribe of Judah. "Lion of the Tribe of Judah" was one of Solomon's titles. Christian interpretation of the phrase springs from Revelation (v, 5), Behold, the Lion of the Tribe of Judah, the Root of David, hath prevailed to open the book and to loose the seven seals thereof. The idea of a resurrection is curiously interwoven with the lion. In the Twelfth Century, one Philip de Thaun stated: "Know that the lioness, if she bring forth a dead cub, she holds her cub and the lion arrives; he goes about and cries, till it revives on the third day. At the loud sounding voice of the father. But the lion was connected with the idea of resurrection long before the Man of Galilee walked upon the earth. In ancient Egypt as we learn from the stone carvings on the ruins of temples a lion raised Osiris from a dead level to a living perpendicular by a grip of his paw; the carvings show a figure standing behind the altar, observing the raising of the dead, with its left arm uplifted and forming the angle of a square. The Lion of the Tribe of Judah, considered as signifying a coming redeemer who would spring from the tribe, or meaning the King of Israel who built the Temple, or symbolizing the Christ, must not be confused with the mode of recognition so inextricably mingled with the Sublime Degree, teaching of a resurrection and a future life. Unquestionably the Israelites absorbed much of Egyptian belief during the Captivity, which may account both for the Lion of the Tribe of Judah, and our own use of the paw. The Five Points of Fellowship contain the essence of the doctrine of brotherhood. And fifteen poyntys there they wrogton. Phillip's New World of Words, published in 1706 defines point as "a head or chief matter." An operative Mason "points" the wall by filling in the chinks left in laying bricks or stone, thus completing the structure. Our Five Points of Fellowship are not allied to these, except as they are reflected in the word "points." We also find this relationship in the Perfect Points of Entrance, once called Principal Points. A change was made in the symbolism of the Five Points in 1843, at the Baltimore Masonic Convention. Prior to that time the Five Points were symbolised by hand, foot, knee, breast, and back. After 1843 the hand was omitted and the mouth and ear tacked on as the fifth. Mackey believed that "The omission of the first and the insertion of the last are innovations and the enumeration given ... is the old and genuine one which was originally taught in England by Preston and in this country by Webb." Such curiosities of ritual changes, though interesting, are more for the antiquarian than the average lodge member. Most of us are more concerned with a practical explanation of the Five Points as they have been taught for more than a hundred years. A man goes on foot a short distance by preference; for a longer journey he boards a street car, rides in an automobile, engages passage on a railroad or courses through the air in a plane. Service to our brethren on foot does not imply any special virtue in that means of transportation. The word expresses the willingness of him who would serve to go at inconvenience and with difficulty, if necessary. We assist our brethren when we can; also we serve them. The two terms are not interchangeable. We cannot assist a brother without serving, but we may serve him without assisting him. A wholly negative action may be a service; suppose we have a just claim against him and because of our fraternal relations we postpone pressing it. That is true service, but not active assistance, such as we might render if we gave or loaned money. How far should we go on foot to render service? Nothing is said in the ritual but the cable tow is elsewhere used as a measure of length. Our own conception of brotherhood must say how far we travel to help our brother. To petition at the altar of the Great Architect of the Universe before engaging in any great or important undertaking is sound Masonic doctrine. We name the welfare of our brethren in our petitions because we love them; knowing our own need of their prayers, we realize their need of ours. Anciently it was written Laborare est orare - to labour is to pray. If indeed labour is prayer, then to pray for our brethren we may labour for them, which at once clarifies the Second Point and makes it a practical, everyday, do-it-now admonition. To work for our brother's welfare is in the most brotherly manner to petition the Most High for him. We often associate something less than proper with the idea of a secret. "He has a secret in his life"; "he is secretive"; "he says one thing but in his secret heart he thinks another" seem to connote some degree of guilt with what is secret. We keep our brother's secrets, guilty or innocent, but let us not assume that every secret is of a guilty variety. He may have a secret ambition, a secret joy, a secret hope - if he confide these to us, is our teaching merely to refuse to tell them or to keep them in the fine old sense of that word - to hold, to guard, to preserve? The Tiler stands watch and ward not to keep the door from others, but to see that none uses it improperly. Thus are we to keep the secret joys and ambitions of our brother close in our hearts until he wants them known, but also, by sympathy and understanding, help him to maintain them. "Do you stumble and fall, my brother? My hand is stretched out to prevent. Do you need aid? My hand is yours - use it. It is your hand for the time being. My strength is united to yours. You are not alone in your struggle - I stand with you on the Fourth of the Five Points and as your need may be, so, Deo volente, will be my strength for you." So must we speak when the need comes. It makes no difference in what way our brother stumbles; it may be mentally; it may be spiritually; it may be materially; it may be morally. No exceptions are noted in our teachings. We are not told to stretch forth the hand in aid if, and perhaps, and but! Not for us to judge, to condemn, to admonish ... for us only to put forth our strength unto our falling brother at his need without question and without stint. For of such is the Kingdom of Brotherhood. More sins are committed in the name of the Fifth of the Five Points than in the name of Liberty! Too often we offer counsel when it is not advice but help that is needed. Too often we admonish of motes within our brother's eye when our own vision is blinded by beams. Reread here Amos vii in the Fellowcraft's Degree. "In the midst of my people Israel" - not in the faraway land; not across the river; not up on the mountain top, but in the midst of them, close to them, an intimate personal individual plumb line! So are we to admonish our brother; not by the plumb, the square, the level we are each taught to carry in our hearts, but by his plumb, his square, his level. If he build true by his own tools, we have no right to judge him by ours. He may differ from us in opinion; he may be Republican where we are Democrat, Methodist where we are Baptist, Protectionist where we are Free Trade - we must not judge him by the plumb line of our own beliefs. When we see a brave man shrinking, a virtuous man abandonings himself to vice, a good man acting as a criminal - then is his building faulty judged by his own plumb line, and we may heed the Fifth of the Five Points and counsel and advise him to swing back true to his own working tools. So considered, these teachings of Masonry, concerned wholly with the relations of brother to brother become a broad and beautiful band of blue - the blue of the Blue Lodge - the true blue of brotherhood. In the Entered Apprentice's Degree we learn of Wisdom, Strength, and Beauty. In the Fellowcraft's Degree we hear of the Doric, Ionic, and Corinthian Columns. In the Master Mason's Degree we hear again of the Three Grand Pillars. In each degree as we progress more and more toward the East from whence comes Masonic Light we discover more interesting meanings of the supports of a lodge. It would take pages where here are but paragraphs even to list the references to wisdom in the Great Light, the word occurs in the Bible two hundred and twenty-four times! For Masons, however, perhaps the most illuminating passages regarding wisdom come from Proverbs (ii 2; iii 13, 14; viii 11). Solomon said: Incline thine ear unto wisdom and apply thine heart to understanding. Happy is the man that findeth wisdom and the man that getteth understanding. For the merchandise of it is better than the merchandise of silver and the gain thereof than fine gold. For wisdom is better than rubbies and all the things that may be desired are not to be compared to it. Knowledge is cognizance of facts. Wisdom is the strength of mind to apply its knowledge. A Mason may know every word of our ritual from the beginning of the Entered Apprentice's Degree to the final words of the Sublime Degree of Master Mason and still have no wisdom, Masonic or otherwise. Many a great leader of the Craft has been a stumbling, halting ritualist, yet possessed in abundance a Masonic wisdom which made him a power for good among the brethren. Knowledge comes from study; wisdom from experience and reflection. Knowledge may be the possession of the criminal, the wastrel, the "irreligious libertine," and the atheist. Wisdom comes only to the wise, and the wise are ever good. The first of the Three Grand Pillars which support our Institution should be to every Mason a symbol of the real need to become wise with the goodness of Masonry, skilled in the arts of brotherhood, learned in the way to the hearts of his brethren. If he know not and ask, "How may I gain Masonic wisdom?" let him find the answer not in the ritual, important though it is; not in form and ceremony, beautiful though they are with the strength of repetition and age - let him look to the Five Points of Fellowship, for there is the key to all real wisdom concerning the brotherhood of man. The second of our Grand Pillars, without which nothing endures, even when contrived by wisdom and adorned by beauty, we know in two forms in our daily lives. First, the strength which lies in action power, might - the strength of the arm, the engine the army. Second, that other, subtler strength which is not the less strong for being passive the strength of the foundation which endures, the strength of the principles my which we live, individually, collectively, nationally - Masonically, It is the second form of strength with which the Speculative Mason is concerned. Freemasons build no temporal buildings. We do lay the cornerstone of the public building in the Northeast Corner, but the action is symbolic, not practical. The operative Mason who sets the stone for the Grand Master would place it as strongly in the building without our ceremony as with it. Our building is with the strength which endures in hearts and minds rather than that which makes the sundry "materials of which an edifice is composed" to do man's will. The Freemason constructs only the spiritual building; his stone is his mind, mentally chipped by the common gavel to a perfect ashlar. The strength by which he establishes his kingdom is not a strength of iron but a strength of will; his pillars support not a wall to keep out cowans and eavesdroppers but a character proof against the intrusion of "the vices and superfluities of life." Beauty is represented in a Masonic lodge by the Corinthian column, most beautiful of the ancient orders of architecture; by the Junior Warden who observes the sun at meridian when the day is most beautiful; by Hiram Abif, who beautified and adorned the Temple. We are taught that it is as necessary that beauty adorn all great and important undertakings as that wisdom contrive or strength support them. In the story of Solomon's Temple in the Great Light we find detailed descriptions of what was evidently, to those who went into details of its construction, the most beautiful building possible for the engineering skill, the wealth and the conception of the people of Israel. Artists dispute and philosophers differ about what is beauty. All of us have our individual conceptions of what constitutes it. As no two men are agreed as to what is beautiful in a material sense, the Masonic conception of beauty cannot be of material beauty. Its symbol of beauty - the sun at meridian - is actually too blinding to see. If we think the sun beautiful, it is for what it does for us, rather than for what it is. The Masonic Pillar of Beauty, then, must be the symbol of an inward loveliness, a beauty of the mind, of the heart; a beauty of the spirit. Our Corinthian column is to us not merely the support of a building but that which upholds a character. Our Junior Warden represents not only the beauty of the sun at meridian, but the illumination by which a life is made beautiful. Hiram Abif is to us not only an exemplary character but an ideal to follow, a tradition to be preserved, a glory for which we may strive. A man may keep every law, go to church three times on a Sunday, belong to our Order, subscribe to every charity and still be mean of spirit, unhappy to live with, selfish, inconsiderate, disagreeable. Such an one has not learned the inward meaning of the Pillar of Beauty. He has never stood symbolically in the South. For him the sun at meridian is but the orb of day at high noon and nothing more. But for the real Mason, who takes lessons of the Three Grand Pillars to heart, beauty is as much a lamp to live by as are wisdom and strength. He finds beauty in his fellow man because his inner self is beautiful. His house not made with hands is glorious before heaven, not because in imitation of Solomon he "overlaid also the house, the beams, the post and the walls thereof and the doors thereof, with gold" but because it is made of those stones which endure before the Great Architect - unselfishness, and kindness, and consideration, and charity, and a giving spirit; of brotherhood genuine because it springs from the heart. For these things endure. Material things pass away. The Temple of Solomon is but a memory. Scattered the stones, stolen the gold and silver, destroyed the lovely vessels cast by Hiram Abif. But the memory, like the history of the beauty and the glory which was Solomon, abide unto this day. So shall it be with our house not built with hands, so be it we build with the beauty which Masons teach. Before the door of all lodges stands a Tiler "with a drawn sword in his hand." Customarily it is a straight blade; such a shining shaft of steel as was carried by knights of olden time. According to Mackey it should have a snake-like shape in allusion to the "Flaming sword which was placed at the east of the Garden of Eden which turned every way to keep the way of the tree of life." "The Book of Constitutions, guarded by the Tiler's sword," is a comparatively modern symbol; its introduction has been traced to Webb, about 1800.
the old trusty sword of Gustavus Adolphus, king of Sweden, that was worn next by his successor in war, the brave Bernard, Duke of Saxe-Weimar, with both their names on the blade, which the Grand Master had ordered Brother George Moody (the king's sword cutler) to adorn richly with the arms of Norfolk in silver on the scabbard, in order to be the Grand Master's sword of state in the future. Early prints of lodge meetings on the Continent show the sword in use in the ceremonies; in this country the sword was never worn in the lodge room even during that era when a sword was as much a necessary article of a gentleman's dress as shoes or gloves. It was deemed then as now incompatible with meeting upon the level. Either as a weapon which made its possessor stronger than the man who was unarmed, or as a badge of rank, the sword has no place in the lodge, except that it is usually presented to the Tiler in the lodge at opening. It is almost universal for the Tiler to request military men in uniform to leave their swords without the lodge before entering. This custom, comparatively little known in this country because few military men in times of peace go to lodge in full uniform, was often broken during the war when soldiers clanked up and down lodge rooms with their arms at their sides. But it is as Masonically inconsistent to wear a sword in lodge as to appear therein without an apron. The Tiler's sword is wholly symbolic; whether it was always so is a matter lost in the mists which shroud ancient history. The Tiler of the operative lodge may well have been armed with a sword for actual defense against the cowan, who wanted the word and the secret of the square without the necessity of serving a long period as an Apprentice and labouring to produce a satisfactory Master's Piece. The modern Tiler keeps off the cowan and the eavesdropper by the simple process of refusing to admit those he does not know; if they still desire to enter the tiled door, they must either be vouched for or request a committee. The Tiler's sword is but the emblem of his authority, as the gavel is the symbol of that possessed by the Master. No symbol in Freemasonry but is less than the idea symbolized. The Volume of the Sacred Law, the letter "G," the Square, the Compasses, all symbolize ideas infinitely greater than paper and ink, a letter formed of electric lights or carved from wood, a working tool of metal. The Tiler's sword has a much greater significance than its use as a defense against invasion of privacy. The eavesdropper from without is no longer feared. The real eavesdropper is the innocent profane who is told more than he should by the too enthusiastic Mason. In the monitorial charge to the Entered Apprentice we hear, "neither are you to suffer your zeal for the Institution to lead you into argument with those who, through ignorance may ridicule it." The admonition of the Book of Constitutions guarded by the Tiler's sword applies here. Constructively if not actively every profane who learns more than he should of esoteric Masonic work is an enemy. Let us, then, all wear a Tiler's sword in our hearts; let us set the seal of silence and circumspection upon our tongues; let us guard the West Gate from the cowan as loyally as the Tiler guards his door. Only by such use of the sword do we carry out its symbolism. To Masons the sword is an emblem of power and authority, never of blood or wounds or battle or death. Only when thought of in this way is it consistent with the rest of the symbols of our gentle Craft, winning obedience to the mandates of the Tiler by brotherly love, an infinitely stronger power than strength of arm, point of weapon or bright and glittering steel. This is one of the oldest and most widespread symbols denoting God. We find it in Egypt, in India, and in the Old Testament. The Open Eye of Egypt represented Osiris. In India Siva is represented by an eye. In the Old Testament we read of the "eyes of Jehovah." Omniscience and omnipresence are rather forbidding words; the All-Seeing Eye expresses in familiar syllables a thought easily comprehended by ignorant and wise alike. The conception of a sleepless Eye which sees not only material but spiritual things; which watches not only externals but the "inmost recesses of the human heart" has that pictorial and imaginative appeal which visualizes to the most matter-of-fact the power and the universality of the Great Architect. We are taught of it as the "All-Seeing Eye whom the sun, moon, and stars obey and under whose watchful care even comets perform their stupendous revolutions." In this astronomical reference is a potent argument for extreme care in the transmission of ritual unchanged from mouth to ear and the necessity of curbing well-intentioned brethren who wish to "improve" the ritual. The word "revolution," printed in the earliest Webb monitors, fixes the astronomical references as comparatively modern conceptions. Tycho Brahe, progenitor of the modern maker and user of fine instruments among astronomers, whose discoveries have left an indelible impress on astronomy, did not consider comets as orbital bodies. Galileo thought them "emanations of the atmosphere." Not until the Seventeenth Century was well under way did a few daring spirits suggest that these celestial portents of evil, these terrible heavenly demons which had inspired terror in the hearts of men for uncounted generations, were actually parts of the solar system, and that many if not most of them were periodic, returning again and again; in other words, that they revoked about the sun. Obviously this passage of our ritual cannot have come down to us by a word-of-mouth transmission from an epoch earlier than that in which men first believed that a comet was not an augury of evil but a part of the solar system, a body which engaged not in irresponsible evolutions but law-controlled revolutions. Here the change of a single letter would destroy an approximate date-fixing reference. Except the All-Seeing Eye, this emblem contains more real food for thought than any other in the lecture of the Sublime Degree. Yet the 47th problem of Euclid generally gets less attention and certainly less understanding than all the rest. The paragraph relating to Pythagoras in our lecture is condensed from one in the Thomas Smith Webb Monitor which appeared at the close of the Eighteenth Century. The 47th problem of Euclid was an invention of our ancient friend and brother, the great Pythagoras, who, in his travels through Asia, Africa, and Europe, was initiated into several orders of priesthood, and raised to the Sublime Degree of Master Mason. This wise philosopher enriched his mind abundantly in a general knowledge of things, and more especially in Geometry, or Masonry. On this subject he drew out many problems and theorems, and, among the most distinguished, he erected this, when, in the joy of his heart, he exclaimed Eureka, in the Greek language signifying, "I have found it," and upon the discovery of which he is said to have sacrificed a hecatomb. It teaches Masons to be general lovers of the arts and sciences. In a sense that Pythagoras was a learned man, a leader, a teacher, a founder of a school, a wise man who saw God in Nature and in number, be was a "friend and brother." That be was "initiated into several orders of priesthood" is history. That he was "raised to the Sublime Degree of Master Mason" is an impossibility, as the third degree as we know it is not more than three hundred years old at the very outside. Pythagoras travelled but probably his wanderings were confined to the countries bordering the Mediterranean. He did go to Egypt, but it is doubtful that he got much farther into Asia than Asia Minor. He did indeed "enrich his mind abundantly" in many matters and particularly in mathematics. That he was the first to "erect" the 47th problem is possible but not proved; at least he worked with it so much that it is sometimes called "the Pythagorean problem." If he did discover it, he might have exclaimed "Eureka," but that he sacrificed a hecatomb - a hundred head of cattle - is entirely out of character, since the Pythagoreans were vegetarians and reverenced all animal life. (47th) In every right angle triangle the square on the hypotenuse is equal to the sum of the squares on the other two sides. (48th) If the square described on one of the sides of a triangle is equal to the square described on the other sides, then the angle contained by these two sides is a right angle. This sounds more complicated than it is. Of all people Masons should know what a square is: a right angle, the fourth of a circle, an angle of ninety degrees. For the benefit of those who have forgotten their school days, the "hypotenuse" is the line which makes a right angle into a triangle by connecting the ends of the two lines which form it. For illustrative purposes let us consider that the familiar Masonic square has one arm six inches long and one arm eight inches long. A square erected on the six-inch arm will contain square inches to the number of six times six, or thirty-six square inches. The square erected on the eight-inch arm will contain square inches to the number of eight times eight, or sixty-four. The sum of sixty-four and thirty-six square inches is one hundred square inches. According to the 47th problem the square which can be erected upon the hypotenuse, or line joining the six- and eight-inch arms of the square, should contain exactly one hundred square inches. The only square which can contain one hundred square inches has ten-inch sides, since ten, and no other number, is the square root of one hundred. This is provable, mathematically, but it is also demonstrable with an actual square. The curious need only lay off a line six inches long, at right angles to a line eight inches long, connect the free ends by a line (the hypotenuse) and measure the length of that line to be convinced - it is, indeed, ten inches long. This is the famous 47th problem. It is the root of all geometry. It is behind the discovery of every mathematical unknown from two known factors. It is the very cornerstone of mathematics. The engineer who tunnels from both sides through a mountain uses it to get his two shafts to meet in the center. The surveyor who wants to know how high a mountain may be ascertains the answer through the 47th problem. The astronomer who calculates the distance of the sun, the moon, the planets, and who fixes "the duration of times and seasons, years, and cycles," depends upon the 47th problem for his results. The navigator travelling the trackless seas uses the 47th problem in determining his latitude, his longitude, and his true time. Eclipses are predicted, tides are specified as to height and time of occurrence, land is surveyed, roads run, shafts dug, bridges built, with the 47th problem to show the way. It is difficult to show why it is true; easy to demonstrate that it is true. Why is two added to two always four and never five or three? Only because we call the product of two added to two by the name of "four." If we expressed the conception of "fourness" by some other name, then two plus two would be that other name. But the truth would be the same, regardless of the name. So it is with the 47th problem of Euclid. The sum of the squares of the sides of any right angle triangle - no matter what their dimensions - always exactly equals the square of the line connecting their ends - the hypotenuse. One line may be a few inches long, the other several miles long; the problem invariably works out both by actual measurement upon the earth and by mathematical demonstration. It is impossible for us to conceive a place in the universe where two added to two produces five and not four. We cannot conceive of a world, no matter how far distant among the stars, where the 47th problem is not a true fact, meaning absolute - not dependent upon time or place or world or even universe. Truth, we are taught, is a divine attribute and as such is coincident with Divinity, omnipresent. It is in this sense that the 47th problem "teaches Masons to be general lovers of the arts and sciences." With the 47th problem man reaches out into the universe, measures distances of the greatest magnitude, describes the whole framework and handiwork of nature. With it he calculates the orbits and the positions of those numberless worlds about us, and reduces the chaos of ignorance to the law and order of intelligent appreciation of the cosmos. With it he instructs his fellow-Masons that the great book of Nature is to be read through a square. Considered thus, the "invention of our ancient friend and brother, the great Pythagoras," becomes one of the most impressive, as it is one of the most important, of the emblems of all Freemasonry, since it is a symbol of the power, the wisdom and the goodness of the Great Architect of the Universe. He who understands the truth behind the 47th problem sees a new meaning to the reception of a Fellowcraft and understands better why a square teaches morality and is dedicated to the Master. If the All-Seeing Eye is the most ancient and the 47th Problem of Euclid the grandest of the emblems of the Master Mason's Degree, the Sprig of Acacia holds the greatest comfort. Not even the Anchor and Ark as symbols of hope speak to Masons as does the simple sprig of evergreen "which once marked the temporary resting place of the illustrious dead." Acacia was a symbol long before Freemasonry existed. It is the shittim wood of the Old Testament, the erica or tamarisk at the foot of which the body of the dead Osiris was cast ashore so that, when found, it would rise again. The Jews have always considered shittim a sacred wood; a symbol of life. Logs of it used in houses sprout long after the tree is destroyed that the beam be made. Everyone is familiar with the evergreen which does not seem to die in cold weather, as do less hardy trees which shed their leaves and sleep through the winter. But if Freemasonry did not make it a symbol, we adopted it as symbolic of our own special Rite and beliefs. Acacia marked the spot where lay all that was mortal of the Widow's Son. Raised from a dead level to a living perpendicular in the very shade of the acacia, how should the plant not stand for immortality, a life to come, the most blessed hope of man? In the stately prayer in the Master Mason's Degree we hear, "For there is hope of a tree, if it be cut down, that it will sprout again -" Later we learn of man who "cometh forth as a flower and is cut down" by the scythe of time which gathers him "to the land where his fathers have gone before him." Uncounted millions have asked. Freemasonry's reply is that glorious immortality symbolized by the Sprig of Acacia. Its reality is attested by every hope of every man born of woman since the first infant cried the birth cry. The Sprig of Acacia has another equally beautiful implication, besides that of certainty of spiritual survival. "Faith is the substance of things hoped for, the evidence of things not seen." The Sprig of Acacia is not only the emblem of a future life but of faith. It matters little what faith that it. It is the existence of some faith which is important; the certainty of things not seen. The Mason may be Methodist, Baptist, Spiritualist, Universalist, Unitarian, Trinitarian, Mohammedan, or Brahmin! He may believe in the orthodox future life of golden streets and milk and honey; his faith may send him to a whole realm of seven planets which with the esoteric Buddhist he must visit in turn; he may believe in the successive planes of Spiritualism or the Nirvana of the Orient - the Sprig of Acacia is at once a symbol of the immortality taught by his faith and of the faith itself. We cannot prove immortality any more than we can prove God. Proof is the result of logic, and logic is a process of the mind. Faith is the product of a process of the heart. We cannot reason ourselves into or out of love; we cannot reason ourselves into or out of faith. There is no Plan without a Planner. That Which Was Lost will at long last be found. Divine life which is ours can no more die than can Divinity. The phraseology is the author's. The teachings are Freemasonry's. Their symbol is the little green sprig which Freemasons drop with their tears on the body of a deceased brother in full faith that - where and how we presume not to say, leaving it wholly to the Eye which sees and the Everlasting Arms which enfold - he, even as we, shall live again. Master Masons are obligated to abide by the laws, resolutions, and edicts of the Grand Lodge, the bylaws of the particular lodges of which they are members, and to maintain and support the Landmarks and the ancient usages and customs of the Fraternity. The written laws, based on the General Regulations and the Old Charges first printed in 1723, are the Constitution and by-laws of the Grand Lodge, its resolutions, regulations, and edicts, and the by-laws of the particular lodge. The Ancient Landmarks are written in some jurisdictions; in others they are a part of the unwritten law. The General Regulations as set forth in Anderson's Constitutions were adopted shortly after the formation of the Mother Grand Lodge in England. Unquestionably they embodied the laws of Masonry as they were known to the four old lodges which formed the first Grand Lodge and hence have the respectability of antiquity. In general the Old Charges are concerned with the relations of the individual brother to his lodge and his brethren; the General Regulations with the conduct of the Craft as a whole. The General Regulations permit their own alteration by Grand Lodge - the Old Charges do not. Many civil laws are provided with measures of enforcement and penalties for infringement. Masonic law knows but four penalties: reprimand, definite suspension, indefinite suspension, and expulsion. These penalties for serious infractions of Masonic law may be ordered after a Masonic trial and a verdict of guilty, but mercy is much more a part of Masonic than of civil law. Infractions of Masonic law resulting in trial and punishment are rare, compared to the number of Masons, the vast majority of whom are so willing to obey the laws that enforcement is seldom required. There is no universality of Masonic law in all jurisdictions. Different latitudes, characters of people, ideas, have all left their marks upon the enactments of our forty-nine Grand Lodges. In the majority of essentials they are one: in some particulars they hold divergent views. Most Grand Lodges adhere to the spirit of the Old Charges, and - so far as modern conditions permit - to the sense of the General Regulations. Masons desiring to understand the laws by which the Craft is governed and the legal standards by which Grand Lodge measures its laws, resolutions, and edicts should read both the Old Charges and the General Regulations of 1723. The last (thirty-ninth) of these General Regulations reads, "Every Annual Grand Lodge has an inherent Power and Authority to make new Regulations, or to alter these, for the real benefit of this Ancient Fraternity; provided always that the old Landmarks be carefully preserv'd," etc. The old landmarks or the Ancient Landmarks as we usually term them are thus those foundations of the law of Masonry which are not subject to change. Had the Mother Grand Lodge formulated the Ancient Landmarks, it would have saved much trouble and confusion for Grand Lodges which came after. Apparently the unwritten law of Masonry - the common law - was so well understood and practised then that it was not thought necessary to codify it. Masons customarily observe a great body of unwritten law; our ancient usages and customs which are not specified in print. But the Landmarks have been reduced to print and made a part of the written law in many jurisdictions. The Landmarks bear the same relation to Masonic law in general as the provisions of Magna Carta bear to modern constitutional law. Just as Magna Carta specified some of the inherent rights of men which all governments should respect, so the Landmarks crystallize the inherent characteristic fundamentals which make Freemasonry, and without which the Institution would be something else. 6. The prerogative of the Grand Master to grant dispensation for conferring degrees at irregular intervals. 10. The government of the Craft when congregated in a lodge, by a Master and two Wardens. 11. The necessity that every lodge, when congregated, should be duly tiled. 13. The right of every Mason to appeal from his brethren, in lodge convened, to the Grand Master. 15. That no visitor, unknown to the brethren present or some one of them as a Mason, can enter a lodge without first passing an examination according to ancient usage. 18. A candidate for initiation must be a man, free-born, unmutilated and of mature age. 20. Belief in a resurrection to a future life. 21. A "Book of the Law" constitutes an indispensable part of the furniture of every lodge. 24. The foundation of a Speculative science upon an operative art. 1. Belief in God as the Great Architect and Supreme Ruler of the Universe. 2. The acceptance of the revealed Word of God as the rule and guide for our faith and practice, and its visible presence in every lodge. 3. The Grand Master is elected by the Craft, and holds office until his successor is duly installed. He is the ruler of the Craft and is, of right, the presiding officer of every assemblage of Masons as such. He may, within his jurisdiction, convene a lodge at any time or place and do Masonic work therein; may create lodges by his warrant, and arrest the warrant of any lodge. He may suspend, during his pleasure, the operation of any rule or regulation of Masonry not a "Landmark." He may suspend the installed officers of any lodge and reinstate them at pleasure, and is not answerable for his acts as Grand Master. He may deputize any brother to do any act in his absence which he himself might do if present. 4. A Masonic lodge must have a Master and two Wardens, and when convened for Masonic work must be duly tiled. 5. No person can be made a Mason unless he be a man free-born, of mature and discreet age, of good character and reputation and having no maim or defect in his body that may render him incapable of kerning the art or of being advanced to the several degrees, nor unless he apply for admission without solicitation and take upon himself the Masonic obligations. Nor can he be admitted to membership in a Masonic lodge except upon a secret ballot by the brethren of that lodge. 6. Masons, as such, are equal; possess the right to visit every lodge or assembly of Masons where their presence will not disturb the peace and harmony of the same, and to appeal to the General Assembly of Masons, or its substitute, the Grand Lodge, whenever aggrieved by any act of a lodge. 7. The Master of a lodge, before his election as such, must have served as a Warden. He and the Wardens are elected by the members of the lodge, but hold their offices by virtue of the warrant of the Grand Master, until their successors have qualified. They are his representatives in the lodge, and are not, therefore, responsible to the lodge for their official acts, nor can they be tried or disciplined by the lodge during their term of office. 8. Every Mason, for Masonic purposes, is subject to the jurisdiction of the lodge within whose Jurisdiction he resides. 9. The legend of the third degree; the means of recognition; the methods of conferring degrees; the obligations of those degrees and the ballot of every brother are and must continue to be inviolably secret. 10. Ancient Craft Masonry includes only the Entered Apprentice, Fellowcraft, and Master Mason degrees. With these as a foundation, the Old Charges for precedent, the first General Regulations for organic law, Grand Lodges write and adopt their constitutions and by-laws and particular lodges write and adopt their by-laws, which are usually subject to approval by Grand Lodge, a Grand Lodge Committee, or the Grand Master. Grand Masters, ad interim, issue edicts and make decisions; often these are later incorporated by the Grand Lodge into the written law of the jurisdiction. All of these together, except where they conflict (as some of the early General Regulations necessarily conflict with later enactments made to supersede them) form the legal structure of Freemasonry. Undeniably it is much looser than the similar body of law for the government of a nation. If Masonic law were interpreted wholly by the letter - as is necessarily the case in civil law - the government of the Craft might often be as loose as its statutes. But as a matter of fact the Craft is well governed. Its ancient usages and customs so soon win their way into the hearts of new brethren that there is a great resistance to any attempt to change the old order, unless necessity shows that it is inescapable. Masons much prefer to whisper good counsel to an erring brother than to subject him to Masonic trial. A Master Mason has rights, duties, and privileges unknown to the Entered Apprentice or Fellowcraft. He is part of a lodge; he is invested with all the powers of a full-fledged member of the Ancient Craft. His vote is as powerful as that of the oldest member; his black cube as potent to keep an applicant out of the lodge as that of the Grand Master. Any Master Mason has the undoubted right to cast a black cube against any applicant. It is his duty to cast it if he knows something about the applicant which would prevent him from becoming a good Mason, a useful member of the lodge. It may be his duty to cast it without such knowledge; if the applicant is one with whom any Master Mason cannot associate in lodge in peace and harmony, he should be excluded. But the Master Mason should consider well and think tolerantly and broad-mindedly of his "peace and harmony." (1) In most jurisdictions a single black cube in the ballot box requires the ballot to be taken again immediately to avoid the possibility of a mistake. If the black cube reappears the second time the applicant is rejected. This rejection does more than refuse the applicant the degrees. It creates a lodge jurisdiction over the petitioner. He may not apply to another lodge for the degrees refused him by this one without first securing a waiver of jurisdiction. He may not again apply even to the lodge which rejected him until after a certain statutory period - usually six months. When his application is again received and brought up for ballot, the fact that he previously applied and was rejected is stated to the lodge. The casting of a black cube not only rejects for the degrees but puts a certain disability upon the applicant which he is powerless to remove. The brother who casts a ballot wields a tremendous power. Like most powers it can be used well or ill. It may work harm or good not only upon him upon whom it is used but to him who uses it. Unlike many great powers put into the hands of men this one is not subject to review or control by any human agency. No king, prince, potentate; no law, custom or regulation; no Masonic brother or officer can interfere with a brother's use of his power. For no one knows who uses the black cube. No one knows why one is cast. The individual brother and his God alone know. The very absence of any responsibility to man or authority is one reason why the power should be used with intelligence and only when after solemn self-inquiry the reason behind its use is found to be Masonic. The black cube is the great protection of the Fraternity; it permits the brother who does not desire to make public his secret knowledge to use that knowledge for the benefit of the Craft. It gives to all members the right to say who shall not become members of their lodge family. But at the same time it puts to the test the Masonic heart and the personal honesty of every brother present. The black cube is a thorough test of our understanding of the Masonic teaching of the cardinal virtue Justice, which "enables us to render to every man his just due without distinction." We are taught of justice that "it should be the invariable practice of every Mason never to deviate from the minutest principles thereof." Justice to the lodge requires us to cast the black cube on an applicant we believe to be unfit. Justice to ourselves requires that we cast the black cube on the application of the man we believe would destroy the harmony of our lodge. Justice to the applicant requires that no black cube be cast for little or mean reasons. Justice to justice requires that we think carefully, deliberate slowly, and act cautiously. No man will know what we do; no eye will see save that All-Seeing Eye which penetrates the innermost recesses of our hearts. A well-used black cube goes into the ballot box. Ill used, it drops into the heart and blackens it. One of the privileges - and one of the responsibilities - of the Master Mason is that of vouching for a brother. To vouch for a Mason is Masonically to say to the brother to whom one introduces him who is vouched for: "I know that Brother A. is a Master Mason." By implication it means (1) that the brother vouching has sat in open lodge with the brother vouched for, or (2) that the brother vouching has subjected the brother vouched for to a strict trial and due examination. In most jurisdictions no brother may undertake a private examination of any man representing himself as a brother without the orders of the Worshipful Master of his lodge, or of the Grand Master. The Worshipful Master is solely responsible for the proper purging of his lodge and therefore has the right to decide who is and who is not competent to examine a visitor. The number of men who have never taken the degrees who try to get into Masonic lodges is very small. Nevertheless there have been, are, and doubtless will be such men; men without principle or honour; eavesdroppers who have beard what was not intended for their ears. Far more dangerous than the eavesdropper is the cowan. In these modern days the cowan is the man who has been legally raised but who bas been dropped N.P.D. or suspended or expelled after trial; or he is an Entered Apprentice or a Fellowcraft whose further advancement has been stopped for cause. If such an one be evilly disposed he may - and has been known to - forge a good standing card to use as credentials. Or he may find a lost card and assume the identity of the name signed upon it. Some brethren are so unwise as to keep their good standing cards from year to year as an interesting collection. If such a collection be stolen it may be the innocent means of letting loose upon the Fraternity a whole flock of designing cowans, since dates upon such cards are changed with little difficulty. It is an excellent Masonic rule to destroy last year's card as soon as this year's card is received. Loss of a current card should be immediately reported to the Grand Secretary, as well as the Master of the lodge. A card should be signed as soon as received. No avouchment may be accepted from an Entered Apprentice or a Fellowcraft. 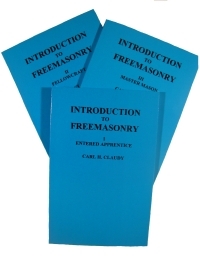 A brother of the first or second degree may be absolutely sure that all those in the lodge in which he took his degrees were Master Masons, but not being a Master Mason he cannot possess lawful Masonic information about Master Masons. Neither is he competent to vouch to a Tiler for any Entered Apprentice or Fellowcraft he remembers as in lodge with him as a Mason of the degree in which the lodge was then open. The right to vouch is strictly a Master Mason's right; no brother of the first or second degree possesses it. Vouching for a brother is a solemn undertaking. Before the lodge the voucher puts his Masonic credit against the credibility of the brother he vouches for. No squeaneshness of feeling should ever interfere. A Master Mason should not vouch for his blood brother even if morally sure his brother is a Mason unless he has lawful Masonic information. No one should ever feel offended because a brother will not vouch for him. A. may remember having sat in lodge with B., yet B. may have forgotten that they sat together in lodge. If B. refuses to vouch for A., A. should be happy that B. is so careful a Mason, not offended that B. does not remember or because "he doesn't trust me." The lodge is more important than the brother. The sanctity of the tiled door is greater than the feelings of the individual. The Masonic honour of the brother doing the vouching should be of far greater worth to him than any consideration of expediency. The entire matter may be covered in one small commandment: "Never vouch unless you have lawful Masonic knowledge." The moral aspects of a Mason's character are foreshadowed in the Entered Apprentice's Degree. He who lives by Brotherly Love, Relief, Truth, Temperance, Fortitude, Prudence, and Justice is a moral man in the best meaning of that much-abused word. A Master Mason has a public as well as a Masonic character; he must be a citizen before he can be a Freemason. All his reputation as a Master Mason, all the teachings of integrity and fidelity, all the magnificent examples of firmness and fortitude in trial and danger - even in the Valley of the Shadow - which a man has been taught as a Master Mason are concerned in supporting with dignity his character as a citizen. Politics are never discussed in Masonic lodges. This law, so well known and obeyed that it is not written in most Grand Lodge Constitutions or lodge by-laws, comes down to us from the Old Charges. In the lodge we meet upon the level and part upon the square. We are not Democrats, Republicans, Socialists, Progressives, but Masons. No lodge may take any political action; to do so would be to draw upon it the immediate censure of the Grand Master and the Grand Lodge. But these prohibitions do not mean that Masons should not study political economy; even as a lodge Masons may listen to talks upon the science of government which is a "political" matter if the word is used in its broad acceptation. Every good citizen is expected to obey the law, uphold the Constitution and the government, do his duty in jury service, go to the polls and vote, bear arms when called to the colors, pay his just share of taxes, take an intelligent interest in the government, his party and political economy, support the public schools, reverence and honour the flag, keep the peace, serve nation, state, county, and town when called to leadership and so to live that his neighbours are happier for his living. When the citizen becomes a Mason he adds to these moral obligations his pledged word, his sacred honour, his character as it is seen naked of God, that he will do certain things and refrain from doing other things. All of these pledges involve not only his duty as a man but as a citizen. The newly raised Master Mason is bidden to "support the dignity of your character on every occasion." The Master Mason should be a better citizen than the non-Mason because he has been better taught and has pledged his sacred honour. In the world of business the employer usually sets the wage for which the workman must labour. The employer is governed partly by the law of supply and demand, partly by his own cupidity or generosity. The wage he pays may be to some extent fixed by labour unions; only occasionally must be pay whatever the workman demands. Usually he pays as little as he can for as much as he can get. In the Masonic world all this is different. A Master's wages are as large as he wants them to be! He can ask any wage he will and get it if he is willing to work for it. No labour union sets the scale; the law of supply and demand does not operate; neither cupidity nor generosity is involved. The only question asked is, "Can you earn the wages you ask?" A Master's wages are paid in coin of the heart, not of the mint. They are earned by what a Mason does with his mind, not his hands. In operative days a Freemason set so many stones and received each man his penny. In Speculative Freemasonry a Master builds into his spiritual temple as many perfect ashlars as he can and receives for his labour uncounted coins of happiness, satisfaction, knowledge, understanding and spiritual uplift. In operative days a Mason's earning power was circumscribed by his strength and his skill. In Speculative Masonry a Mason's earning power is circumscribed only by his wit and his desire. He may read these little books, receive his penny, and be satisfied. Or he may see them for what they are: only an introduction, a gateway, a sign pointing out the path and read and study and ponder until he has earned not one but a handful of pennies, each penny a thought, each thought a blessing, making life easier to live. Archaeologists dig through the ruins of a city to uncover a forgotten one below. Push the spade in deeper and below the forgotten city is yet another, older, different, twice forgotten of men. City buried under city, patiently uncovered by the student's excavating tools - such are the symbols of Freemasonry. Dig through the outer shell and find a meaning; cut down through that meaning and find another; under it if you dig deeply enough you may find a third, a fourth - who shall say how many teachings? The Master Mason builds. Before he builds he digs a foundation. Let him who would receive all that Freemasonry has to give dig deeply into the symbolism, the history, the philosophy, the jurisprudence and the spiritual meanings of the Ancient Craft. So, and only so, will he become a real Freemason - free to travel in foreign countries and receive Master's wages. Space here forbids telling even in outline of the spread of Freemasonry into other lands. The interested student may read the fascinating story for himself in many excellent histories of Freemasonry. Here we must confine ourselves to a very short sketch of the coming of Freemasonry to America - a subject the beginnings of which are clouded in legend, veiled in tradition and misty in lack of records. The first native born American Mason is generally conceded to have been Jonathan Belcher, who was made a Mason in England in 1704. In June, 1730, the Duke of Norfolk, Grand Master of the Mother Grand Lodge, appointed Daniel Coxe, of New Jersey, the first Provincial Grand Master in America. Johnson (1) says "There has appeared no evidence, however, that he exercised this deputation." McGregor (2) says: "I was fortunately able to find a letter written by Daniel Coxe to James Alexander, dated from Trenton, N.J., July 31, 1730, thus definitely determining his (Coxe's) presence here." On April 13, 1733, a deputation was issued to Henry Price as "Provincial Grand Master of New England and Dominions and Territories thereunto belonging." If Coxe never exercised his authority under his deputation, then Henry Price was, as most historians claim, the father of Freemasonry in America. If Coxe did exercise his authority under his deputation, then he deserves that honour. (1) Melvin M. Johnson, Past Grand Master of Massachusetts. His learned and comprehensive The Beginnings of Freemasonry in America is exhaustive and complete. (2) The late David McGregor, Historian of the Grand Lodge of New Jersey was a student of tireless energy and resource, with a profound knowledge not only of early Freemasonry in New Jersey and Pennsylvania but of early Colonial history in general. Both McGregor and Johnson are historians and research workers of scholarly ability. Brethren in New Jersey and Pennsylvania almost universally agree with McGregor; brethren in New England in general and Massachusetts in particular agree with Johnson. Into the merits of this friendly controversy and the claims of two great Grand Jurisdictions this sketch cannot go. Perhaps we shall do well to await the "further light" of future historical research. After all, to most of us it matters little! Freemasonry came to the Colonies in the early third of the Eighteenth Century and spread and grew, made its own place in the hearts of the Colonists and played a mighty if quiet part in the stirring events which were to sever the Thirteen Colonies from the motherland and to form the United States. Regular authority was granted for the establishment of duly constituted Freemasonry in New England in 1733; in all North America in 1734; in South America in 1735; in South Carolina, Georgia, and New Hampshire in 1735 or 1736; in the West Indies and New York in 1737; in Antigua and Nova Scotia in 1737-38; in Jamaica and St. Christopher in 1739; in the Barbados in 1739-40; in Bermuda, 1742; in Newfoundland, 1746; in San Domingo, 1748; and in Rhode Island, 1749. By the close of the first half of the century not less than forty lodges had sprung from the Provincial Grand Lodge in Boston. Others had been warranted direct from London. In point of priority, then, the following lodges have precedence in the history of regularly constituted lodges in America: the Lodge of Boston in 1733; the Lodge at Montserrat second, in 1734; the Lodge of Philadelphia in 1734-35; the Lodge in Savannah, Georgia, and the Lodge in Charleston, South Carolina, in 1735; the Lodge in Portsmouth, New Hampshire, in 1736; and so on as the list lengthened. The earliest American by-laws or regulations of a lodge were adopted in 1733, but no mention is made of any degrees. Masons were either "made" or "admitted" and nothing more until 1736, when for the first time the degree of Fellowcraft is named. Not until three years later, however, do we find such an entry as the following, in Portsmouth, New Hampshire: "Capt. Andrew Tombes was made a Mason and raised to a Fellowcraft." The records of Tun Tavern Lodge, of Philadelphia, in 1749, use the words "entered," "passed," and "raised" as we use them now.